Taumarunui in the King Country has recently lost its Memory Bank, with the sale of its land and building by the trust that owned it. Most valuable historical resources have been saved by a quick thinking local historian but serious questions should be asked over the secret meetings that led up to the sale, the utter shambles within the trust and where the money is going. I believe that the surprise/urgent sale was money driven and that the public will be very concerned when the truth outs. Confusion and secrecy are usually bed-mates! Local historian and author Ron Cooke (Cookie) is well known in the King Country. Knocking 80 years old, and when many would have retired years previously, Ron is still pushing forward with half a dozen writing projects on the go. A local photographer and author he’s written and researched dozens of historical works and was the guy who established The Taumarunui Museum Trust three decades ago. According to the man himself, he personally secured The Memory Bank building (the old ANZ Bank). He organised the initial funding and gained the trust of the community, who obliged with donations of thousands of photographs, negatives and original newspapers. His claim is that many within the community have only donated their family treasures because of their trust in him. That rings very true from my investigation. I first met Cookie in January 2018 when I was scoping out the King Country as a potential location for one of our activities. Both of us being authors, we kept in contact and I reconnected with him recently, shortly following the sale of The Memory Bank premises. In the 2000s, he had a dust-up with the other trustees and their falling out seems to have left a dysfunctional operation for the last couple of decades or so. The new guy Weston Kirton came in to sort things out a few years ago, which he did partially, but I doubt that anybody could claim that The Memory Bank has achieved much spectacular in that time! Ron though has operated his business ‘Abundant Past Ltd’ from an office at the rear of the building. He writes, providing photographs and other services related to history of the region. 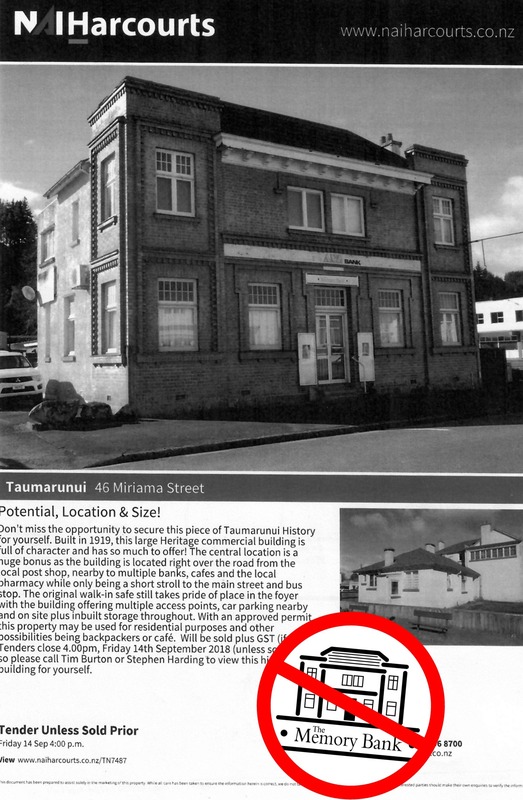 In Q4, 2018, the Taumarunui Museum Trust gave Ron notice that they were selling the building. No warning. Nothing other than a simple letter giving him notice that the sale was proceeding. The new owner gave him two weeks to clear out his (and the TMT’s resources). He did. It appears to all of course as though The Memory Bank will be no more. I’m told that Ron spent 116 hours in November 2018 removing the bulk of the historical records from The Memory Bank and getting them into private storage to save them from total loss. It appears that The Taumarunui Museum Trust has simply lost interest in their core business, gone out of business and with the building sale, they’ve cashed up. The property was listed for tender (GV: $80,000.00) and eventually sold to an Auckland businessman in November 2018 for $70,000.00 who intends to establish an art gallery or some form of art centre. Ummmm. Yeah! While my investigations have revealed a lot of the background, nobody else knows who made the decision to sell up, nor when, nor why. The TMT Trust Deed is a private document, and the trustees have remained tight-lipped over everything to do with the sale. Chairman Weston Kirton told me that the trustees would be meeting to discuss this all in mid February although an emergency meeting was called recently and different people around town are getting different stories. A statement made publicly that “funds raised from the sale of the building have been set aside for this [housing the artifacts] purpose” contradicts later statements made from the Chariman and a Trustee that “no decision had yet been made yet” and belies reason seeing as they no longer have the core resources! Confusion exists. Apparently there is disagreement among the trustees about whether the trust should even be wound up or not, and details of the distribution of the cash appear to be sketchy if not actively hidden. Certainly trust meeting minutes are not available to the public and are jealously guarded. According to my research the critical meeting in which the winding up and sale of the building was deliberately kept secret, as is their latest emergency meeting, and the latest statement of intent was a knee-jerk panic reaction in response to a threat for a legal claim on the sale proceeds from an organisation I established (KCET). The sale of The Memory Bank building raises very serious questions for me as to the potential use of the funds gained. The building has been owned by the trust for decades freehold and it was paid for by donations from the residents of the Taumarunui/King Country region – donated for a specific purpose – to house and protect those valuable community archives, irreplaceable photographs and complete collections of newspapers going back 100 years or more! With the voluntary demise of The Taumarunui Museum Trust and the divesting of the bulk of the resources (My estimate is that some 95% of the archived resources have been saved, some have gone ‘sideways’ and the remaining rest of them are in a two-year storage) whatever the trust has secured from the property sale should [by rights] be invested back into the re-housing, maintenance and protection of the resources donated by the community. If they don’t then this will be a breach of trust from the trustees, in other words trustee misconduct – bad-faith, which is grounds for High Court action under s.68. Aside from the personal matters relating to Ron Cooke’s eviction and the ethical conduct of TMT leadership, winding up a trust for the purposes of cashing up the value of an asset in order to shuffle cash out to other projects (no matter how worthy they may or may not be) is misappropriation plain and simple. In the context of the aging historian Ron Cooke having to desperately act to save the resources donated by the community over the years in good faith, this is not only an apparent act of greed (and if done in secret, dishonesty), it is also IMHO utterly immoral. I’ve written a book about this all, giving a synopsis of the troubled Trust, the circumstances leading up to the sale and the events following the sale. It’s an interesting if macabre read and I’ll be launching it at a public meeting in Taumarunui on 4th February 2019, 7.00pm at the Ruapehu Community Arts Centre if you’re local. One thing that is extraordinary is my dealings with these guys – I have done EVERYTHING by the book and the Chairman of the TMT (who was the Mayor at one time) simply refuses to talk to me. As a politician I guess us straight shooters can be seen as a major threat, but he should know that it’s the cover-up that gets you. I dropped a line to the local rag before Christmas letting them know what was up. The trust then issued the newsman a story full of BS talking about things of the past and totally ignoring the tens of thousands of images and archives donated to the TMT over the years. It will all come back to bite them if or when it goes to court. My take is that it’s a big mistake to say one thing to one person, and them another thing somewhere else when I’m on the case! People who want to know the truth should be asking these questions, of course I pretty much know all the answers after having investigated them. Who wrote the media release published in Taumarunui Bulletin on 19 January 2019 which the above quote was taken from and who made this quoted decision, why and when? [Hint: Seek any TMT Board meeting minutes (if they exist) and compare the dates of receipt of any correspondence received]. There are some very serious issues relating to TMT conduct, leadership and recent decision-making which I will be blogging about and sharing in due course. It is not all bad news, despite a rather negative headline about dark clouds in the local rag. In fact there is very good news for the hugely patient and supportive Taumarunui community without a cloud in sight, that I can see. Mind you I tend to look forward . . . vision and leadership and all that. I suspected that the loot had already gone ‘West’ – people who act secretly and suspiciously (especially when money is involved) generally like to and do act to cover their tracks. This latest media statement from TMT that they intend to carry on in business indicates that the money is still in their bank account. If so, then this is good news for Taumarunui – I think I can take credit for stopping it going out to TRACS or other pet projects of the TMT Trustees – which was being discussed openly in 2018. I will update this post when I become aware of further developments. As always any party mentioned here has full Right of Reply, which I encourage them to utilise. A public meeting will be held on Monday 4th February, 2019 at 7.00pm in the Ruapehu Community Arts Centre, Hakiaha St, Taumarunui in which I will introduce KCET, and answer any questions the public may have about recent developments. A Media Release about the meeting is here. Disclaimer: I personally have assisted Ron Cooke in multiple ways in relation to the above subject matter, including establishing KCET, the King Country Education Trust, the new owner of the bulk of the TMT’s archives. Cookie and I are also close friends. My investigation was self-funded.